Over the past day, militants made 34 shelling attacks at the positions of Ukrainian army in the area of the anti-terrorist operation in Donbas. As a result, one Ukrainian fighter died and two were wounded. In a Monday release on Facebook, the press center of the ATO said that in the Donetsk sector the enemy pounded the ATO positions in the area of Troyitske with 120-mm and 82-mm mortars, grenade launchers of various systems and heavy machine guns. The defenders of Avdiyivka came under the fire of 120-mm mortars, anti-tank grenade launchers and heavy machine guns. Pisky, Luhanske and Novoselivka-Druha were fired at from 82-mm mortars and grenade launchers. The ATO positions in the vicinity of Butivka coalmine and Nevelske were shelled from grenade launchers, heavy machine guns. The enemy fired small arms near and near Zaitseve. In the area of Luhanske, the terrorist fired IFV weapons. Enemy snipers were active in the area of Avdiyivka. In the coastal sector, militants fired 82-mm mortars and anti-tank grenade launchers at the ATO positions near Taramchuk and Maryinka. Hnutovo was shelled IFV weapons, automatic grenade launchers and heavy machine guns. The enemy used small arms near Shirokyne. The positions of Ukrainian marines in the areas of Vodiane and Pavlopil were under sniper fire. 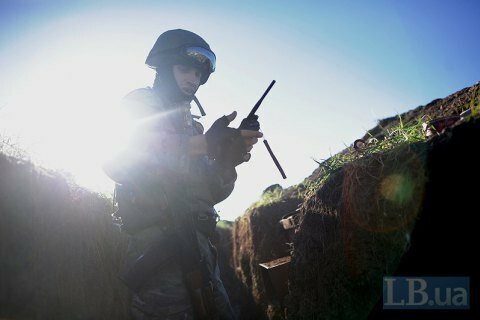 IN the Luhansk sector, the positions of Ukrainian armed forces in the area of Novozvanivka were pounded with 82-mm mortars, grenade launchers and heavy machine guns. In the area of Stanytsya Luhanska, ATO troops came under the fire of enemy's infantry fighting vehicles and grenade launchers, much the same was the picture in the area of Novooleksandrivka. The ATO positions near Valuyske were fired at from grenade launchers and small arms.